Southport is one of the nicest places in UK. It is quiet, peaceful and beautiful, from the seaside, marine lake, theme park, famous shopping aracades, sand dunes, forests, Victorian streets and much more, there is plenty to see and do. Festivals and events are running all year round such as the Jazz Festival, the Flower Show, the Air Show, the Golf Grand Open. 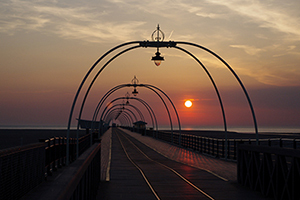 Historically, Southport was a part of Lancashire that was founded in 1792. William Sutton, an innkeeper from Churchtown, built a bathing house at the south end of Lord Street calling it the Duke's Folly Hotel. In that time the area was very sparsely populated and dominated by sand dunes. In the 19th Century the Victorian era, the area was benefited and became tourist centre by the easy access of the Leeds and Liverpool Channel during the Industrial Revolution and the town grew rapidly. 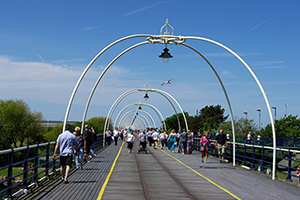 Southport attractions include Southport Pier and its Pier Tramway, the second longest seaside pleasure pier in the British Isles. Among the attractions are Victoria Park, Lord Street and others lots of places that we can explore. Lord Street is the famous Boulevard that inspired the Champs Élysées in Paris, France. It was told that the exiled Prince Louis Napoleon lived in Southport in 1838 and admired the long straight wide tree-lined Lord Street. Later he remembered the Lord Street's elegance when he returned to France as Emperor and he transformed Paris by implementing its now famous Boulevard. 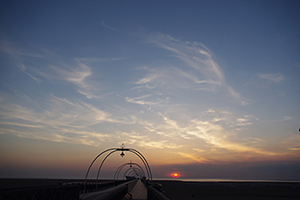 In summer, take a walk along the shore, we see the beauty of Southport.